The 2019 Crosstrek Hybrid will become Subaru’s first plug-in model (PHEV) when it goes on sale later this month. It replaces the previous Crosstrek Hybrid that was offered from 2014-’16 in the U.S. market as a regular gas-electric hybrid (HEV). The plug-in rides on Subaru’s new-generation Global Platform that was designed to offer hybrid and electric drivetrains. With its new Star Drive Technology, Subaru says the Crosstrek Hybrid can travel up to 65 mph in full electric mode, has an EV range of 17 miles, targets 90 MPGe, and a total range of 480 miles. 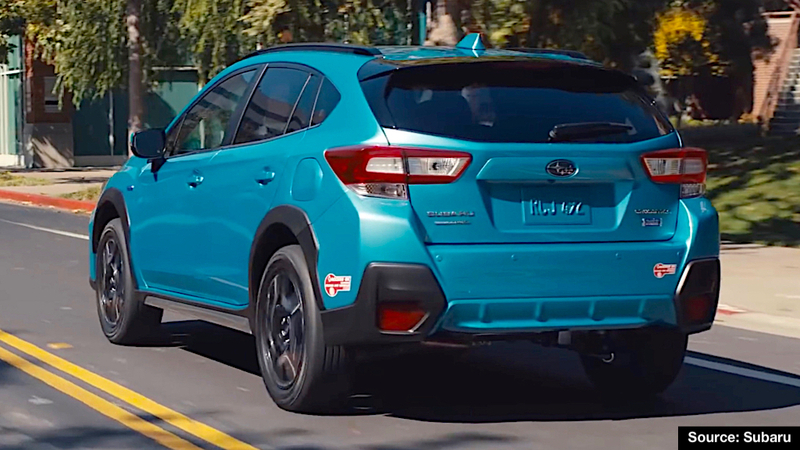 Unique exterior features for the Crosstrek Hybrid include a charge-port door in the left rear fender, Plug-In Hybrid badges, blue headlight rings, silver-metallic finish grille, lower front bumper and body cladding, 18-inch alloy wheels with machine finish, and available Lagoon Blue Pearl paint. 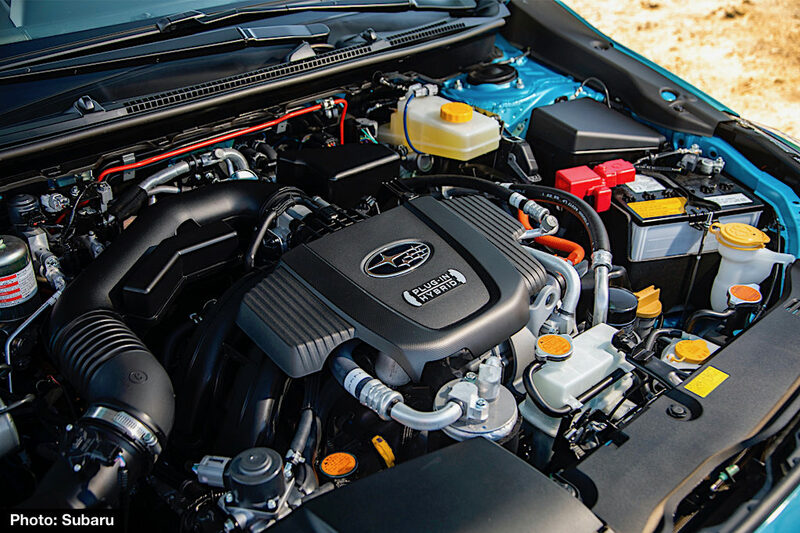 The series-parallel plug-in hybrid system combines the Crosstrek’s 2.0-liter direct-injected 4-cylinder Boxer gas engine with two electric motor generators. One operates as a power generator to charge and maintain the hybrid battery along with starting the gas engine. The second supplies drivetrain power output for hybrid and EV modes, while charging the hybrid battery during regenerative braking. 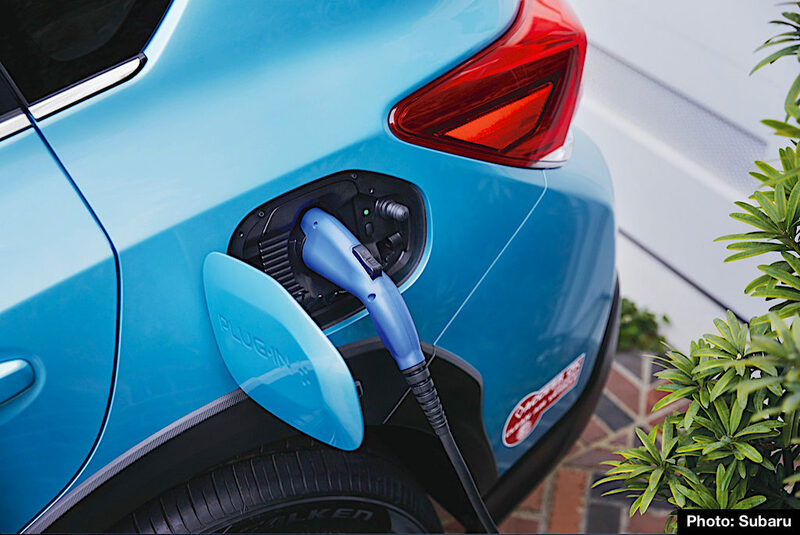 Plugged-in to a Level 1 (120V) outlet, estimated charging time for the Crosstrek’s lithium-ion battery pack is 5 hours, or 2 hours using a Level 2 (240V) source. Subaru’s Symmetrical All-Wheel Drive is standard, and so is a new Lineartronic Continuously Variable Transmission (CVT) with X-Mode and Hill Descent Control. 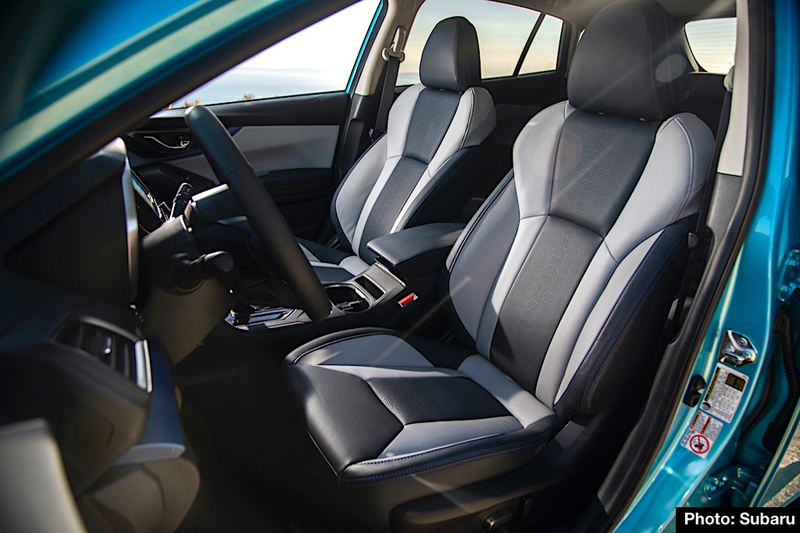 Crosstrek Hybrid is dressed with Gray and Navy Blue leather-trimmed seats, door panels and armrests while blue stitching and accents are used throughout the cabin. Heated seats, auto climate control, and dual USB ports are standard. SI-Drive switches on the leather-wrapped steering wheel let the driver customize throttle response by selecting “Intelligent” or “Sport” modes. Standard 8.0-inch STARLINK Multimedia Plus features Apple CarPlay™ and Android Auto™. Navigation, Harman Kardon audio, heated steering wheel and a power moonroof are included with an option package. Remote Climate Control and Remote Battery Charging Timer are new features for STARLINK Connected Services. The former can pre-heat or pre-cool the cabin, while the latter lets the driver manage the schedule for vehicle charging as well as monitor its status. Instrumentation for Crosstrek Hybrid includes a 4.2-inch color LCD along with a power meter that displays real-time power output and regeneration. A multifunction display, located above the center stack, lets the driver monitor hybrid functions including driving and charging screens. 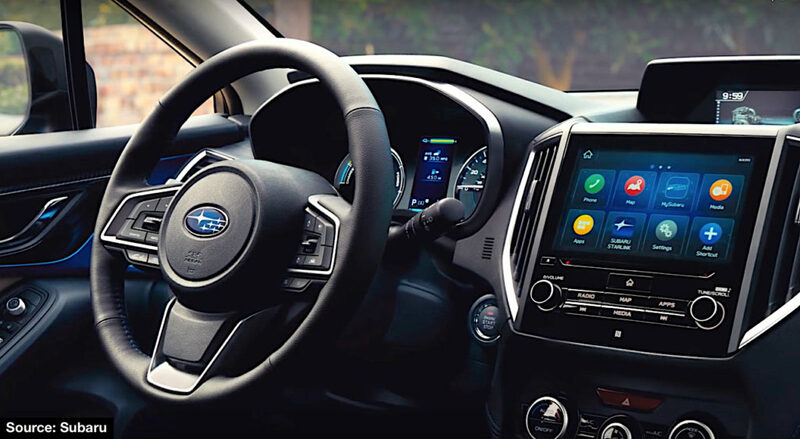 Crosstrek Hybrid includes EyeSight® Driver Assist Technology with features like Pre-Collison Braking, Adaptive Cruise Control, Lane Departure Warning, and Lane Keep Assist. Steering Responsive Headlights are also standard, and so is Reverse Automatic Braking, and Blind Spot Detection with Lane Change Assist and Cross Traffic Alert. 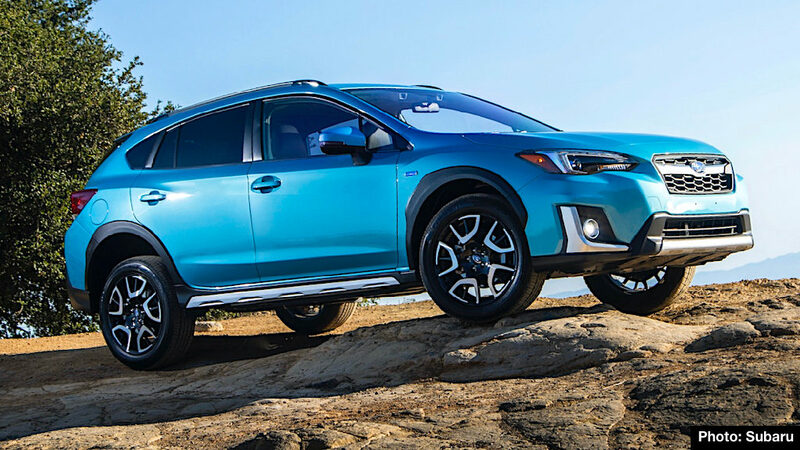 Subaru’s suggested base MSRP for the 2019 Crosstrek Hybrid in the U.S. is $34,995 plus $975 destination and delivery†, while the option package lists for an additional $2,500. Features, specifications, and prices for U.S. models are subject to change without notice. †Destination and delivery charge may vary in some states and is higher in Alaska. * Consult an IRS tax representative and/or official IRS publications for more information on potential tax credits. News source, photos and video courtesy Subaru of America, Inc.